Before purchasing this ring, my husband and I did lots of research. We were extremely skeptical of buying a diamond ring online. 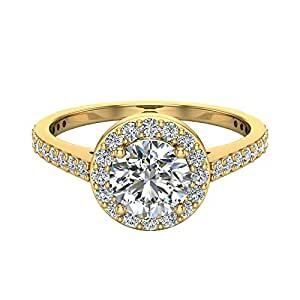 But, after shopping at numerous jewelry stores, and finding no diamonds as large as this one, and for almost double the price; we decided to give to it try. With the 30 day money back guarantee, we felt we had nothing to lose. Long story short, we are beyond thrilled with this ring!! If you are looking for a diamond, but not looking for jewelry store prices…this is the ring for you!